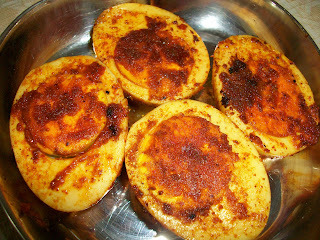 Egg chilli Fry is nothing but a simple & spicy side dish using boiled eggs & spices. This egg chilli fry goes well with any mild pulao, biryani, rasam & rice, variety rice etc. This is one easy to make recipe with great taste. A must try for egg lovers. Take eggs in a sauce pan add 2-3 cups of water and bring it to boil (with lid closed) for 10-12 minutes after that switch off the stove and leave it rest for 3-4 minutes. Then drain the water and peel the shell and use. Cut eggs in to 2 half and keep aside. Using a spoon,apply the chilli masala paste all over the eggs and set aside for few minutes. Heat a pan,add some oil and place 2-3 pieces of eggs at a time and roast/fry for a minute on both sides. After frying on both the sides remove from the pan and serve hot. Adjust the spices to your spice level. (hot or medium). ooohh... this looks so good. i make something similar but fry the egg as a whole and then split it up... this looks yummy too! Looks delicious, I can't wait to try this! I'm just starting to get interested in Indian cooking, how do you call this dish in your language? 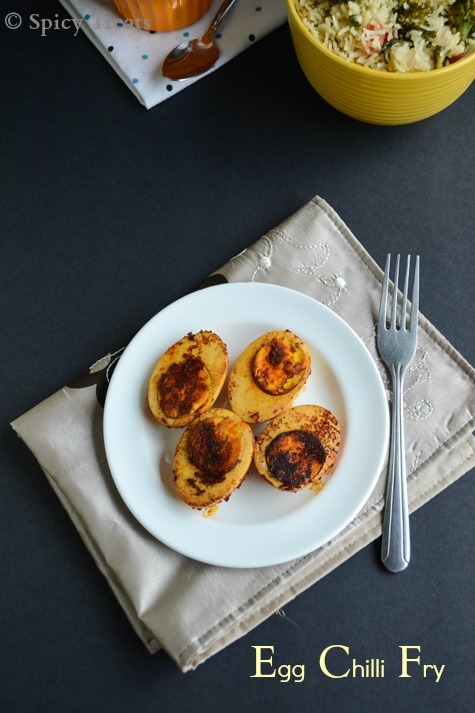 Yep.,this is a delicious egg fry, we call it as "Muttai Varuval" in Tamil Language :) Its nice to know that you like Indian recipes, if you try any recipes here would like to hear your feedback. Thanks!